Being FC Barcelona's goalkeeper is a huge responsibility that only a few are capable of taking on. It's a unique role, and those who have flourished in the position are fondly remembered at the Camp Nou. 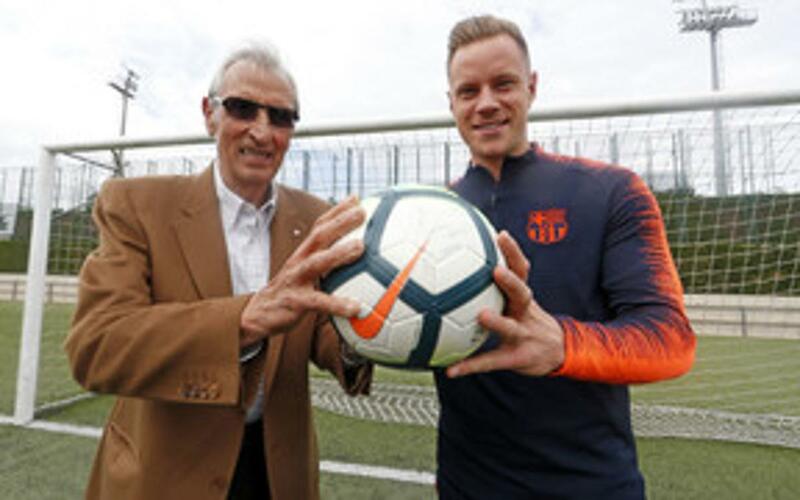 Two such shot stoppers met recently at the Ciutat Esportiva: Salvador Sadurní, the first team goalkeeper between 1961 and 1976, and current custodian Marc-André ter Stegen chatted before a training session about their experiences. After a warm embrace between the two, Sadurní was quick to praise Ter Stegen, telling him that "Technically you are very good. When you take a risk playing the ball with your feet, and it doesn't work out, you keep on going. That's very important for a goalkeeper." Sadurní played some 464 games for Barça and is one of the most successful goalkeepers in the club's history. He won three Zamora trophies, played a part in the 1973/74 title win, and was outstanding in the 1968 Copa del Rey final, amongst other honours. Ter Stegen, who has been at the club since 2014, has also become a fan favourite. During their talk, Ter Stegen showed interest in the club's history, and drew parralels between Sadurní's replacing Ramallets and his introduction to Barça, taking over from Claudio Bravo. "The fact that Sadurní was at Barça for over 15 years shows what he is like as a person," said the German. "I didn't want to be just another foreign player. I wanted to find out about the history of the club. It's also why I wanted to speak the language from the start." Sadurní gave his view on Ter Stegen's technique with a dash of humour, mentioning that he likes his positioning but that "everything can be improved. Also, you have to be careful about shots from distance." "I'm amazed by him. Having met him, I understand perfectly why he's succeeding here."